By Scott Gilfoid: Richard Schaefer of Golden Boy Promotions is betting that IBF/WBA light welterweight champion Amir Khan will become a huge star under his helm at Golden Boy. 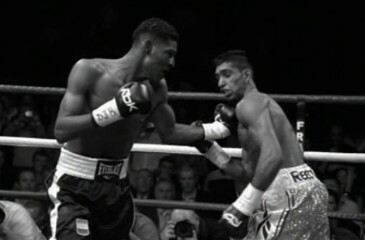 Schaefer not only sees Khan becoming a star, but also the pound-for-pound king in boxing. I hope Schaefer isn’t too mentally involved in all of this because he’s going to be in for a huge let down when Khan gets slapped down again. Future events cast their shadows before, and Khan has already been exposed in the past against Breidis Prescott and was nearly beaten again by Marcos Maidana. As far as I can tell, pound-for-pound kings aren’t supposed to get drilled into the canvas by guys like Prescott and aren’t supposed to go life and death with fighters like Maidana and then get saved by the referee. I wonder at what point in the future Schaefer sees this vision happening? 2 years? 10 years? 15 years? I hate to be the one to drizzle all over Schaefer’s vision thing but Khan isn’t going to be pound for pound anything I’m afraid. It’s not going to happen. Maybe Schaefer can match Khan up against weak guys and then yak that he’s the best pound for pound long and hard 24/7, 365 days a year, but I really don’t see anyone buying any of that. This can’t be accomplished through sleight of hand tricks where Khan is matched against weak non-punchers over and over again, and then Schaefer emerges saying Khan is the best fighter since sliced bread. Schaefer is wasting his time. Khan has to beat the best and that means beating the guy that spanked him Prescott, beating Maidana without a referee saving Khan when he’s getting pummeled, and beating Victor Ortiz, Andre Berto, Mike Jones, Kell Brook, and Floyd Mayweather Jr. I can’t see Khan beating any of those guys, and his win over Maidana is tainted in my eyes because of the referee pulling Maidana off of him. I think Schaefer needs to cut his losses and find someone that has a chin and can be matched against anyone – punchers or boxers. You can’t have a fighter that you’re steering around punchers while at the same time crowing that he’s the best fighter pound for pound in boxing. That’s silly.